Background Endovascular treatment of intracranial aneurysms usually involves stent-assisted coiling (SAC) and flow diverters. Glycoprotein IIb/IIIa inhibitors such as tirofiban and dual antiplatelet therapy (DAPT) are required to prevent thromboembolic complications afterwards. We sought to determine the safety of tirofiban and DAPT in these cases. Methods We conducted a retrospective analysis of our database for patients with intracranial aneurysms who underwent SAC or flow diversion. The tirofiban-DAPT protocol used is described. Data regarding duration of infusion, placement of external ventricular devices (EVDs), complications, haemoglobin levels and platelet count before and 24 hours after antiplatelet therapy were collected and analysed. Results One-hundred and forty-one patients with 148 aneurysms/procedures were included. 110 aneurysms were treated acutely and 38 electively. Minor and major haemorrhagic events were recognised in 20% (30/148) aneurysms. Only 5 (3.4%) intracerebral haemorrhages were symptomatic: 3 cortical/SAH and 2 EVD-related. The average blood volume in symptomatic haemorrhages was 24.8 cc versus 5.42 cc in asymptomatic haemorrhages (p=0.002). The rate of EVD-related haemorrhages was 15.7% (19/121) and only 2 (1.7%) were symptomatic. Most haemorrhagic events occurred in ruptured aneurysms (90.1%, p=0.01). No significant change in platelet count or haemoglobin levels before and 24 hours after administration of tirofiban and DAPT was documented. Concomitant administration of heparin did not increase haemorrhagic events. Conclusion The use of the GP IIb/IIIa inhibitors tirofiban and DAPT in this series was safe. Tirofiban and DAPT did not affect platelet count or haemoglobin levels and did not increase rate of symptomatic haemorrhages or thromboembolic complications. Stents and flow diverters are routinely used for endovascular embolisation of intracranial aneurysms.1 2 Despite its many advantages, intravascular deployment of these devices has been associated with a significant rate of thromboembolic complications, ranging from 2% to 15% and associated with a 3.8% risk of permanent morbidity and mortality.3 4 Glycoprotein (GP) IIb/IIIa inhibitors and dual antiplatelet therapy (DAPT) are often required to prevent thromboembolic complications.5 However, intraoperative and postoperative care of patients with intracranial aneurysms who are on a GP IIb/IIIa inhibitor infusion followed by DAPT can be challenging due to the risk of haemorrhagic complications. Moreover, ruptured aneurysms may require external ventricular devices (EVD) placement or long-term ventriculoperitoneal (VP) shunting, which may pose a higher risk of haemorrhagic complications. The aim of this study is to determine if tirofiban followed by DAPT increases the risk of haemorrhagic events and haematological disorders in patients undergoing neuroendovascular surgery for treatment of intracranial aneurysms. After institutional review board approval, we conducted a retrospective analysis of our prospectively acquired neurointerventional database at the University of Iowa Hospitals and Clinics for patients who underwent stent-assisted coiling (SAC) or flow diversion treatment of intracranial aneurysms from January 2015 to the end of March 2018. We have previously described our protocol with the GP IIb/IIIa inhibitor tirofiban in the treatment of intracranial aneurysms with flow diversion and SAC.6 7 Briefly, we start a 0.10 µg/kg/min maintenance infusion of tirofiban intraoperatively (immediately before or after deployment of the flow diverter/stent). This infusion without a bolus is continued for at least 2 hours. To achieve anticoagulation an initial 50–100 U/kg bolus of heparin after deployment of the first coil or flow diverter/stent was administered. Activated clotting time is maintained at two to three times the baseline intraoperatively. All patients were loaded with 600 mg clopidogrel and 325 mg aspirin intraoperatively and maintained on daily clopidogrel (75 mg) and aspirin (81 mg) afterwards. Administration of tirofiban was determined by reviewing anaesthesia records and medicine administration reports from electronic medical records. Patients were excluded if the tirofiban infusion deviated from our standard infusion protocol,7 or if their medical records were incomplete. Post-subarachnoid haemorrhage (post-SAH) patients with hydrocephalus underwent EVD/VP shunt placement according to evidence-based guidelines.8 9 Endovascular treatment of the aneurysm followed treatment of the hydrocephalus and within 24 hours of presentation in case of acutely ruptured aneurysms. 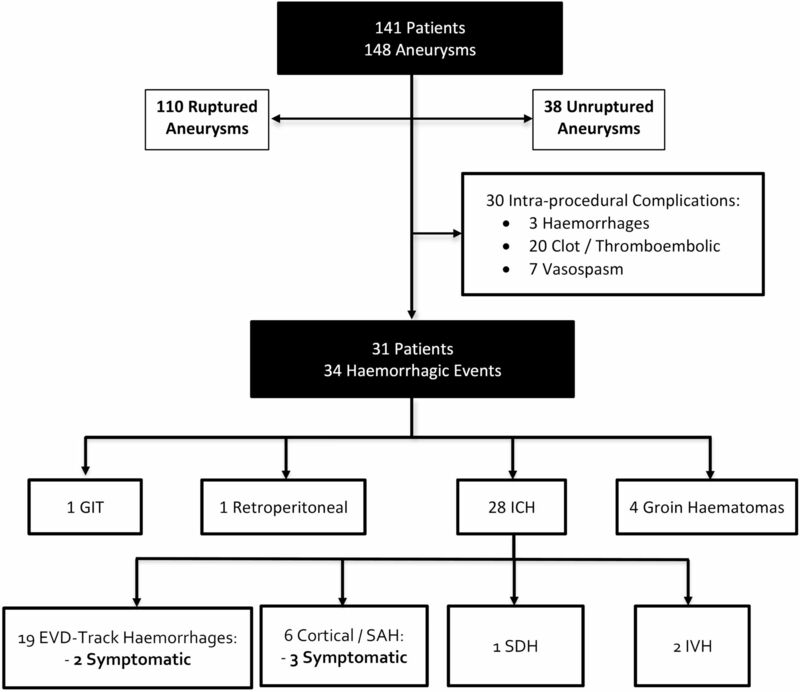 When patients presented with SAH, the infusion of tirofiban and the administration of DAPT was initiated during the endovascular treatment of the aneurysm and after hydrocephalus was treated with EVD placement. Patients' demographic information was collected. For each aneurysm, morphological data including location, whether the aneurysm had ruptured as well as Hunt and Hess Score and Fisher Score were collected. Detailed information on the administration of tirofiban and intraprocedural heparin was recorded. Information about the placement of EVDs, including the time between EVD placement and the initiation of tirofiban and DAPT was collected. The intraprocedural administration of heparin was also recorded. All bleeding events were included, whether they were major or minor. Symptomatic ICH haemorrhages were determined based on European Cooperative Acute Stroke Study (ECASS) II criteria.13 New onset seizures with an epileptogenic focus on the site of the haemorrhage as determined by electroencephalography was also considered symptomatic. Any other extracranial symptomatic bleeding event was defined as a major event. Other major bleeding events included a significant drop of haemoglobin that required a blood transfusion or caused haemodynamic instability or an additional surgical intervention such a haematoma evacuation. Haematological values such as haemoglobin and platelet count before and 24 hours after surgery were recorded. Disposition of discharge was used as an outcome indicator. Patients were divided based on the presence of haemorrhage on follow-up CT. Continues variables were compared using Student’s t-test or Mann-Whitney U test as a non-parametrical alternative, whereas χ2 test or Fisher’s exact test was used to calculate the proportion difference between discrete variables. Subsequently, univariate analysis was used to calculate the association between haemorrhagic events and relevant clinical, laboratory and pharmacological characteristics studied. Significant variables (p<0.3) were included in a backward, stepwise, multivariate analysis. A value of p≤0.05 was set as statistically significant. Statistical analysis and graphical display of data were performed using GraphPad software V.7.03 (GraphPad Software) or SAS V.9.3 software (Statistical Analysis Systems Institute). One-hundred and forty-one patients with 148 aneurysms/procedures were included in the study (table 1). The mean age was 57.1±14.0 years (range 22–91). Most patients were female (66.7%). One-hundred and ten aneurysms were treated acutely and presented as SAH (treated within 24 hours of presentation) and 38 aneurysms were treated electively. Thirty minor/major intraprocedural events (20%) were documented: 3 haemorrhages, 20 clot formation/thrombosis and 7 vasospasms (figure 1). The three patients who had intraprocedural haemorrhage presented acutely with SAH secondary to ruptured aneurysms located in the anterior communicating, posterior communicating and posterior cerebral arteries. None of these patients developed new symptoms as a result of the intraprocedural haemorrhage. Despite the use of heparin, tirofiban and DAPT during the procedure, we did not encounter worsening of the SAH in follow-up CTs in patients who did not suffer an intraprocedural rupture. Flow chart illustrating patients and events. EVD, external ventricular device; GIT, gastrointestinal tract; ICH, intracranial haemorrhage; IVH, intraventricular haemorrhage; SAH, subarachnoid haemorrhage; SDH, subdural haemorrhage. Minor and major haemorrhagic events were documented in 20% (31/148) aneurysms/procedures (table 2). Thirty-one patients had a total of 34 haemorrhagic events: 1 gastrointestinal haemorrhage (3.1%), 1 retroperitoneal haematoma (3.1%), 28 ICH (87.5%) and 4 groin haematomas (12.5%). None of these events required acute intervention or were symptomatic, except for five ICH haemorrhages. ICHs were divided as follows: EVD track haemorrhages=19/121 (15.7%), cortical/SAH=6/148 (4.1%), subdural haemorrhages=1/148 (0.7%) and IVHs=2/148 (1.4%). Only 5 (3.4%) haemorrhages were symptomatic: cortical/SAH=3 and EVD track haemorrhages=2. The average volume of blood of the symptomatic intraparenchymal haemorrhages was 24.8 cc versus 5.42 cc in the asymptomatic haemorrhages (p=0.002). Most haemorrhagic events occurred in ruptured aneurysms (90.1%, p=0.01) (table 3). This trend was significant in univariate and multivariate analyses. No significant change in platelet count before and 24 hours after the administration of tirofiban and DAPT was documented. There was no significant change in haemoglobin levels before and after the administration of tirofiban and DAPT. Intravenous heparin was administered during the procedure (median 3000 U) and the concomitant administration of heparin was not related to more haemorrhagic events. One-hundred and one, 18 and 2 patients underwent placement of one, two and three EVDs, respectively. The rate of EVD-related haemorrhages was (19/121: 15.7%), with 10 grade I haemorrhages, and 2 (1.7%) of these haemorrhages were symptomatic. On average, EVD-related haemorrhages occurred 11.9 hours after the EVD was placed and the infusion of tirofiban was started and DAPT was administered. In EVDs without haemorrhage, the endovascular treatment of the aneurysm/infusion of tirofiban and DAPT was initiated on average 21 hours after placement of the EVD (OR 1.00, 95% CI 0.99 to 1.01, p=0.27). Twenty-eight patients underwent VP shunt placement. Haemorrhagic events associated with VP shunt placement were noted in 10.7% (3/28) patients. However, none of these events were symptomatic: one cortical and two track haemorrhages. Of the 148 procedures, in 66 (44.5%) occasions patients were discharged home, 61 (41.2%) to acute rehabilitation or skill nursing, and 2 (1.3%) to hospice. Nineteen patients died: 12 patients with poor neurological exam as a result of the initial SAH, 6 from medical complications of the SAH and 1 patient due to an EVD track haemorrhage. In this study we have determined the safety of using tirofiban and DAPT during neuroendovascular procedures requiring stenting or placement of a flow diverter. The overall rate of symptomatic haemorrhages was 3.3%. Moreover, there were no significant haematological changes after the concomitant use of tirofiban and heparin. Platelet counts and haemoglobin values mildly decreased without any significant impact on the rate of haemorrhagic complications. Previous authors have reported mixed results as related to the risk of thrombocytopenia with GP IIb/IIa inhibitors. A meta-analysis of all major prospective cardiac trials performed by Dasgupta et al reported that abciximab increases the incidence of thrombocytopenia compared with placebo in patients also treated with heparin.14 Tirofiban and eptifibatide alone or in combination with heparin did not result in a statistically significant higher incidence of thrombocytopenia than heparin use alone. The exact nature of GP IIb/IIIa induced thrombocytopenia is not well established. Bougie et al demonstrated that acute thrombocytopenia with tirofiban or eptifibatide is secondary to GP IIb/IIIa complex-reactive drug-dependent antibodies.15 This reaction develops within hours of starting the intravenous administration of the GP IIb/IIIa inhibitor and usually subsides after stopping the infusion. The advantage of tirofiban over abciximab is that the former is a reversible antagonist and has a rapid onset of action of approximately 5 min. Abciximab binds irreversibly to the GP IIb/IIIa receptor causing platelet function suppression for almost 48 hours, which increases the risk of ICH.16 In this study we did not document any significant platelet or haemoglobin drop. Moreover, in univariate and multivariate analyses, there was no relationship between the mild decrease of platelet count (platelet count ratio 0.94) and haemoglobin value (haemoglobin ratio 0.91) and the occurrence of haemorrhagic events. This is the first neuroendovascular study to address the occurrence of thrombocytopenia and anaemia in patients who undergo tirofiban infusion and DAPT for treatment of intracranial aneurysms. The inhibition of the platelet GP IIb/IIIa receptor with tirofiban in unstable angina and non-Q-wave myocardial infarction study (Platelet Receptor Inhibition in Ischemic Syndrome in Patients Limited by Unstable Signs and Symptoms (PRIMS-PLUS))17 did not report any case of ICH within a sample of 1570 patients. In that study, 773 patients received heparin concomitantly with tirofiban. Overall, patients affected by neurological diseases such as ischaemic stroke and SAH are more likely to develop ICH. Moreover, neuroendovascular procedures such as aneurysm SAC and flow diversion carry an inherent risk of haemorrhagic and ischaemic complications. A rate of 7.4% permanent neurological complications has been described in patients treated with SAC.18 The Pipeline for Uncoilable or Failed Aneurysms (PUFS) Trial reported a 5.6% rate of major ipsilateral stroke or neurological death in patients who underwent flow diversion with placement of a pipeline device (Medtronic) for treatment of large supraclinoid aneurysms, and only 1.9% (2/107 patients) of ipsilateral intraparenchymal haemorrhages were reported.19 Patients in this trial were treated with DAPT and all the procedures were elective cases. Our rate of symptomatic ICH was 3.3% despite the use of tirofiban and heparin during the procedure, followed by a DAPT load. Moreover, almost 75% of our cases are ruptured aneurysms, which increase the risks of complications. Approximately 20% of patients with SAH require EVD placement.20 The overall rate of EVD- associated haemorrhage is between 18% and 26%.11 12 21 22 A study of 46 patients with aneurysmal SAH by Gard et al reported a 58.8% rate of track haemorrhages (grades I–II=7) in the subgroup of patients who received heparin (4000–7000 U bolus) within 4 hours of EVD placement.11 Our rate of EVD-associated haemorrhages was 10%, despite the concomitant use of heparin and tirofiban during the neuroendovascular procedure and a loading dose of DAPT. Our average infusion time of tirofiban was 318 min in patients with haemorrhagic events and 470 min in patients without haemorrhagic events. Haemorrhages were more common when heparin and tirofiban were started on average 11.9 hours after EVD placement, instead of 21 hours in patients who did not develop EVD track haemorrhages. It suggests that a longer time between EVD placement and the endovascular treatment of the aneurysm may be safer when administering intraoperative tirofiban, heparin and DAPT. Binz et al reported a 5.7% rate of radiographic haemorrhage in patients who underwent EVD placement on DAPT, with less than 1% of these haemorrhages becoming symptomatic.23 We documented a 1.6% rate of symptomatic track haemorrhages related to EVD placement. Thus, although EVD-related haemorrhages are relatively common with the intravenous infusion of tirofiban and DAPT, these haemorrhages are rarely symptomatic. We propose a new classification of EVD/VP shunt—related haemorrhages based on these findings: grade I =≤1 cc haemorrhage along the EVD track and grade II =>1 cc haemorrhage at any location along the EVD track or in the ventricle but contiguous to the catheter tip. This new classification reflects our observation that low-volume (≤1 cc) haemorrhages are often seen along the EVD/VP shunt tracks of patients on DAPT, but are rarely symptomatic. In contrast, larger haemorrhages (>1 cc) may become symptomatic.24 The rate of haemorrhagic complications on patients undergoing VP shunt placement was 10.7% (3/28 patients). None of these haemorrhages was symptomatic and all patients were on DAPT. Most case series reporting the endovascular treatment of intracranial aneurysms with SAC/flow diversion have used an intraprocedural bolus of heparin and the oral administration of DAPT. Chalouhi et al described a 4.6% rate of thromboembolic complications (24 cases: 6 instent thrombosis, 14 new symptomatic ischaemic strokes and 4 clinically silent ischaemic strokes) in a series of 508 aneurysms treated with SAC.1 It is important to note that 91% of cases in that study were unruptured aneurysms treated electively, and significant difference was found in overall procedural complications between ruptured and unruptured aneurysms (25% vs 4.7% respectively, p<0.001).1 The seemingly low rate of thromboembolic events in elective cases might be due to appropriate anticoagulation and a preoperative DAPT regimen. A recent case series by Cohen et al of 71 aneurysms (78.8% treated acutely) reported an 8.5% rate of intraoperative thromboembolic complications, all successfully managed with intra-arterial antiplatelet agents.2 Of note, since flow diverters tend to be more thrombogenic, they implemented a strict antiplatelet protocol with two different clopidogrel non-response cut-offs based on P2Y12 reaction units: >240 for standard stents and >207 for flow diverter stents. Non-responders were managed with either ticagrelor (loading dose 180 mg and maintenance 90 mg/12 hours) or prasugrel (loading dose 40 mg and maintenance 5–10 mg/day).2 In our case series, most aneurysms presented ruptured with SAH and were treated emergently (110/148, 74.3%) vs 38 (25.7%) aneurysms treated electively. However, only 20 (13.5%) thromboembolic complications occurred during endovascular intervention. Moreover, all were adequately managed intraoperatively and patients remained asymptomatic afterwards. Liang et al described their experience with 175 patients with acute SAH who underwent SAC after the therapeutic infusion of tirofiban.25 A 2.71% rate of ICH was reported. Systemic heparinisation was achieved with an intravenous bolus of heparin (50–70 U/kg), followed by intermittent injections of 1000 U/hour to achieve an activated clotting time between 250 s and 300 s. Heparinisation was reversed after the procedure with protamine. During stenting tirofiban was administered: 8 µg/kg bolus for 3 min immediately before stent deployment, followed by a 0.10 µg/kg/min maintenance infusion. Aspirin (300 mg) and clopidogrel (300 mg) were administered 2 hours before stopping intravenous tirofiban. Another small series reported on the use of tirofiban for SAC of acutely ruptured intracranial aneurysms. Kim et al treated 41 patients with SAC and intravenous tirofiban: 0.4 µg/kg/min bolus for 30 min, followed by 0.10 µg/kg/min maintenance infusion.26 Intravenous heparin was administered (5000 U/1000 mL of 0.9% normal saline) as a maintenance infusion through the guide catheter, but no bolus was infused. Ten patients underwent EVD placement and two developed asymptomatic track haemorrhages. One hundred and ten aneurysms on our series were treated acutely after SAH with an infusion of tirofiban without a bolus. We also administered heparin (mean of 3000 U) during the endovascular procedure for anticoagulation. Aspirin (325 mg) and clopidogrel (600 mg) were administered during the procedure as a loading dose. Cardiac trials like the Tirofiban Novel Dosing vs. Abciximab with Evaluation of Clopidogrel and Inhibition of Thrombin (TENACITY) Study have used larger doses of tirofiban: 25 µg/kg bolus over 3 min, followed by a 015 µg/kg/min infusion.27 Based on the results of the studies of Liang and Kim, and our series, we recommend the following protocol for SAC or placement of a flow diverter in treating acutely ruptured intracranial aneurysms: a maintenance infusion of tirofiban without a bolus may be started at a dose of 0.10 µg/kg/min, heparin may be administered during the procedure to achieve proper anticoagulation without significantly increasing the rate of haemorrhagic events, and aspirin and clopidogrel may be given 2 hours before stopping the tirofiban infusion. Our study has some limitations, mainly its retrospective design, lack of randomisation and heterogeneity of the study population. However, all procedures were performed by the same group of operators following an institutional standardised protocol. Imaging studies were reviewed by a blinded adjudicator. It is also difficult to discern if haemorrhagic events occurred due to the infusion of tirofiban or the use of DAPT. Currently, we are performing a pilot study with only the intravenous infusion of tirofiban to determine its safety and efficacy in treating intracranial aneurysms (NCT03691727). The use of the GP IIb/IIIa inhibitor tirofiban and DAPT in this series of 148 aneurysms treated with SAC and flow diverters was safe. Tirofiban and DAPT did not significantly decrease the platelet count of haemoglobin levels and did not increase the rate of symptomatic haemorrhages or thromboembolic complications.
. Hemorrhage rates associated with two methods of ventriculostomy: external ventricular drainage vs. ventriculoperitoneal shunt procedure. Neurol Med Chir 2014;54:545–51.
. Randomised double-blind placebo-controlled trial of thrombolytic therapy with intravenous alteplase in acute ischaemic stroke (ECASS II). Second European-Australasian Acute Stroke Study Investigators. Lancet 1998;352:1245–51.
. Acute thrombocytopenia after treatment with tirofiban or eptifibatide is associated with antibodies specific for ligand-occupied GPIIb/IIIa. Blood 2002;100:2071–6. Platelet Receptor Inhibition in Ischemic Syndrome Management in Patients Limited by Unstable S, Symptoms Study I. Inhibition of the platelet glycoprotein IIb/IIIa receptor with tirofiban in unstable angina and non-Q-wave myocardial infarction. N Engl J Med 1998;338:1488–97. Contributors EAS: study design, manuscript preparation and guarantor of the study. EG: acquisition of data. DN: data analysis. JAR and DMH: manuscript preparation, critical revision of the manuscript for important intellectual content. SO-G, MZ, PJ: revision of the manuscript. All authors reviewed, edited and approved the final manuscript. Funding This study was supported by an educational grant from Medicure. Competing interests EAS is a consultant for MicroVention and Medtronic. SO-G is a consultant for Stryker. EG, DN, JAR, MZ, PJ and DMH declare no conflicts of interests. Data sharing statement Any additional information regarding our neurointerventional database will be provided after appropriate request.